At Encino Smile Design, we provide a range of dental implant solutions. Implants are considered the gold standard for replacing missing teeth in a natural way. A single dental implant can replace one missing tooth, or as little as two dental implants can provide support for a bridge, a partial or a full denture. A handful of dental implants can even replace an entire upper or lower arch of teeth with a fixed, non-removable solution that restores most of the strength and stability of natural teeth. No longer will you have to worry about your denture slipping, pinching, or experience the inability to chew a tough steak or sticky candy. 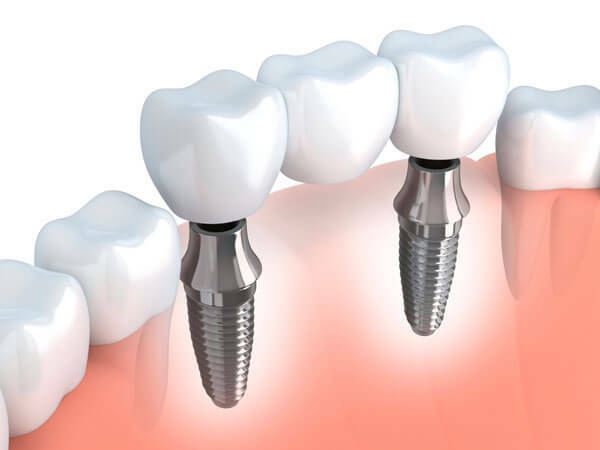 Today’s dental implants are made from a medical grade titanium alloy (similar to a hip replacement) that integrates into your jawbone like a tooth root. New research, though, shows that modern ceramics may eventually replace titanium alloy as the material of choice for implants. As soon as this material demonstrates long-term success, we will begin offering it as an option to our patients. Once the implant has been placed, we restore it after an appropriate healing time with a porcelain crown, or another option that was discussed and agreed upon beforehand. With over 26 years of experience in restoring and placing implants, we may be able to help you with a desired outcome. Please call us at 818-986-8060 to learn more and schedule your appointment.